Pahiatua’s Polish World War II refugees: A group of young Poles made a new life in New Zealand. 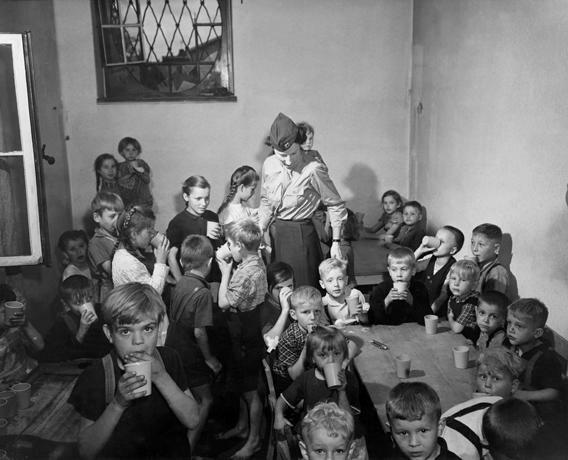 An American Army Public Health nurse with a group of children in a camp for Polish displaced persons at Bensheim,Germany on June 19, 1945. Other Polish children ended up in New Zealand as refugees. WELLINGTON, New Zealand—A fish restaurant in New Zealand seemed an odd place to discuss a war that took place several thousand miles away and several decades ago, but there we were: Sea bream was served, sauvignon blanc was poured, the rain drummed down outside, and I listened while three septuagenarians smiled, laughed, and told me of the unimaginable tragedy they had lived through as children. All three were born in eastern Poland, and all three were arrested and deported, along with hundreds of thousands of other Poles, after the Soviet invasion in 1939. Soviet soldiers and police packed their families into boxcars and exiled them to Siberia or central Asia, where many died of illness or starvation. Only in 1942, after Hitler’s invasion of the Soviet Union, were survivors released and allowed to form a Polish army in exile. After crossing the border into Iran, the adults formed themselves into fighting units and began to travel back to Europe via Palestine. But their children could not fight. Some were already orphans, having lost their parents to hunger or disease. More would lose their parents, or lose track of their parents, in the course of the war. An international appeal went out: Thousands of Polish children could not remain in Isfahan forever. Among others, New Zealand—a country that had never before accepted refugees—responded. On Oct. 31, 1944, their ship pulled into Wellington harbor. More than 750 orphans, from toddlers to young teenagers, and 100 adult caretakers, teachers, and doctors disembarked. Hundreds of New Zealanders met them at the port, cheering and waving flags. More people lined the roads and waved as the Polish orphans drove through the countryside to a refugee camp created for them in Pahiatua, a village in the southeastern corner of New Zealand’s North Island. There they stayed together, studied together, organized Polish scouting troops, and waited for the war to end so they could go home. But in another sense there was a happy ending—one that we might usefully contemplate. In recent years, the gap in educational attainments of rich and poor Americans has grown wider, largely because of the enormous resources many of us pour into our children. Success, we have come to believe, depends on excellent schools, carefully organized leisure and, above all, on high-concentration, high-focus parenting. But more than 70 years later, the now-elderly children of Pahiatua have an additional explanation. Zdzislaw Lepionka now believes that “the fact that we weree kept together, that we sang Polish songs and did scouting drills together— that was a kind of therapy.” Lepionka was 3, he thinks—there are no records—at the time of his family’s deportation. His mother died in exile; he lost track of his father, whom he never saw again. But he and those of his siblings who boarded the boat to Wellington long ago founded families and careers of their own. Decades later, he is still in touch with many of the “Pahiatua children,” who still offer one another moral support. Is an idyllic childhood a prerequisite for a happy life, or are there other roads to contentment? Are parents the key to future success, or are there other ways to get there? Is a turbulent childhood always a recipe for adult failure, or can some people overcome tragedy? I saw many amazing things in New Zealand—a volcano, a geyser, and some extraordinary lush, green landscapes—but none made me think more than that Wellington lunch.